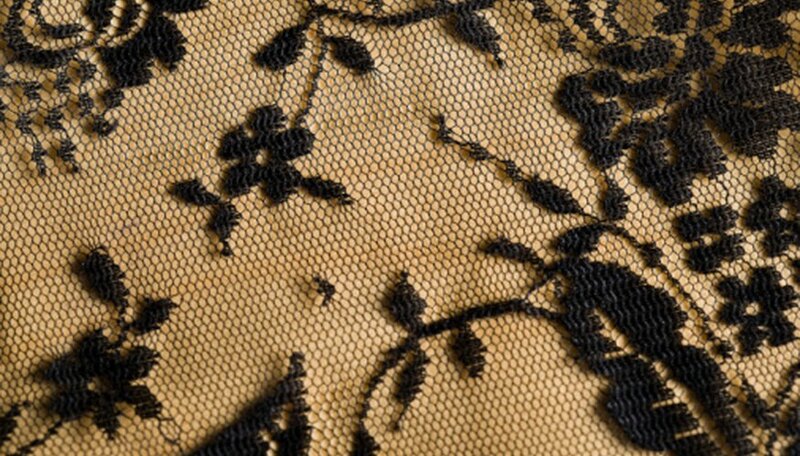 Lace fabric is a delicate fabric that flaunts a look of elegance and femininity. It is often used to make wedding dresses and christening dresses, as well as curtains. Lace is produced in a variety of attractive designs, and the weight of lace fabric varies. Since beautiful designs are weaved into lace fabric, small hand stitches can be easily hidden. To make a flawless hem on lace fabric, put away your sewing machine and blind hem, or blind stitch, your lace fabric by hand using slip stitches. Slip stitches are stitches that are weaved into fabric in a way so they are barely visible. Set your iron on a low setting. Examine your lace fabric to find out which edge of the fabric is the top edge and which is the bottom so you know which edge you must hem. If your lace fabric has a floral design in it, make sure the flowers are not upside down. Lay your towel on your ironing board once you know which edge you will be hemming, and then lay the lace fabric on top of it, right side facing down. Fold 1/4 inch of the bottom edge of the lace fabric in towards the wrong side of the fabric and iron the fold. If the lace is thin, fold the fabric up again, 1/4 inch. If the lace is on the thick side, fold 3/4 inch of fabric over to the wrong side of the fabric. Iron the second fold so that the hem lies flat. Pin your hem in place, using your box of pins. Thread your needle with the thread that does not match the color of your lace fabric, make a knot at the end of the thread and baste the hem with basting stitches. Basting stitches are long stitches used to hold a hem in place long enough to create permanent stitches. They are pulled out after the permanent stitches are made. Remove the pins from the lace fabric, and begin creating your slip stitches by inserting your needle threaded with the matching thread under two threads in the flat piece of fabric, not the folded piece. Pull the needle and thread all the way through the flat piece of fabric, then insert the needle into the edge of the first fold, directly above the stitch you just made. Pull the thread all the way through the folded edge, and then insert the needle into two threads in the flat piece of fabric that are situated about 1/4 inch to the left of the first stitch you made. Continue to hem the lace fabric in this manner until you reach the end of the fabric. Make a knot in your last stitch and remove the basting stitches. Touch the corner of your lace fabric with the tip of your iron before ironing it to make sure your iron is not too hot.